We BBQ Jews are not ones for idleness. While Porky was on his Canadian billboard photo safari, I headed to Chile to research meat consumption. As with my Turkey letdown, there’s bad culinary news for visitors to the South American nation: they’re not particularly fond of chili. 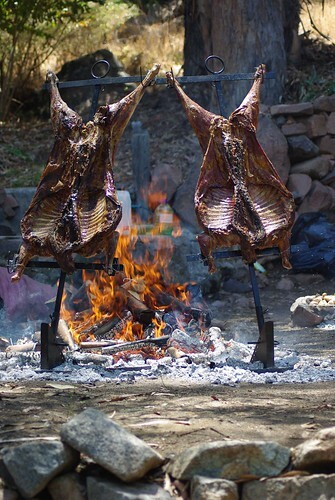 While in Chile, I was lucky enough to get invited to a catered barbecue cookout attached to a farm tour. Since I was traveling with a group of chefs, the organizers stepped up their culinary game. I had to laugh at the juxtaposition (and I swear I didn’t move the bottle to set up the above photo). On the one hand, they were cooking lamb (for about 6 hours) in that arduous, time-consuming, legit way familiar to anyone who’s made or maybe even eaten NC ‘cue. And then they were grilling pork ribs smothered in the corniest, corn syrup-iest of sauces. 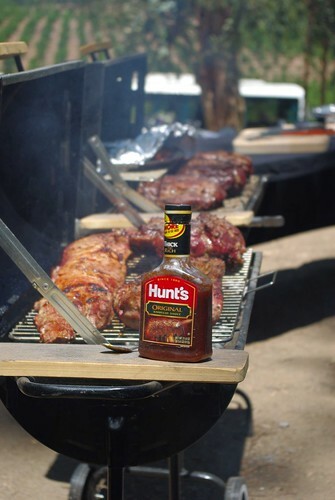 Upon seeing that bottle, I made up my mind to forego the ribs altogether. But who was I kidding. I mean…have you seen my nom de blog? P.S. — Give $ to Chile! Help earthquake victims get back to eating lamb like this. Fantastico! What on earth were you doing in my homeland?! With my Dad being Chilean and my Mom being from Rocky Mount, I really know how to appreciate some ‘cue! Dad even built a firepit in the backyard so he can do asado in the summer. Thanks for helping bring attention to this awesome place- they really need help now!